Larger and better equipped than hand held power tools, the right machinery can easily turn the toughest and most expensive jobs from a nightmare into a dream. Is also becomes a very cost effective alternative when you calculate the time you will save, the low level of exertion that is required, and the satisfaction and pride you will feel upon your job’s completion. 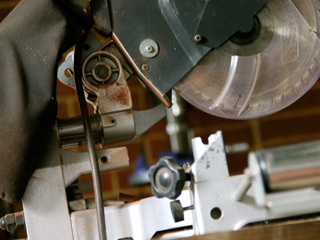 Machinery is manufactured for both home use and trade use. Machinery available on the market today has been divided into the following categories. The machinery discussed here does refer to large power tools. For hand held power tools, please see Power Tools. The wattage stated on all power tools is know as input power, and is an indication of the demand a tool will place on a power outlet under normal operating conditions. A general power outlet (GPO) is rated to 2400W. This means two tools of a nominal wattage totalling more than 2400W must be used on separate GPO’s.